Do you want to create the fabulous, soft beachy waves, and looking for the best curling iron for beachy waves? Below are some practical skills we highly recommend you follow to learn how to get beach waves! Beachy waves are all the rage. Though they may take some practice to get the hang of, they always look effortless, as if you didn’t even have to try to look beautiful. It’ll be your little secret. There is a lot to consider when choosing how to do beach waves. Do you want to invest a little extra money in a higher end model? Or perhaps you want to try the newest and greatest inventions that will practically do the beach waves for you. Even if there’s a small learning curve with how to use a new curling iron, are you willing to put in the time to learn how to create your awesome new hairstyle? Maximum Heat : Turbo heat boost temperature. 11 How to Get Beachy Waves? 12 Four Easy Ways to Get Beachy Waves! 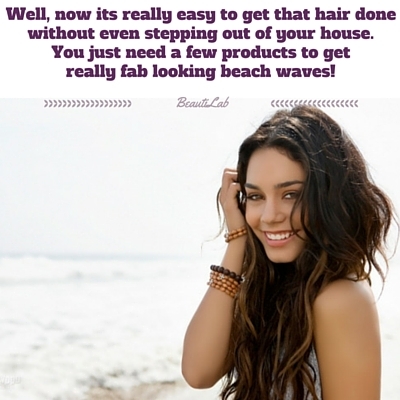 You don’t have to spend a lot of money on getting beautiful beach waves. You can do it from the comfort of your home with the Paul Mitchell Neuro Unclipped rod. Now we all know that curling can be tedious if you have long hair, often the wand is too short. Well with this extra-long curling rod you can easily curl past shoulder length hair .the curling wand heats up to a maximum of 450f. The digital display is clear and shows the exact temperature. You can then adjust the heat according to your hair type .the titanium barrel heats up quickly in 40 seconds. The auto shut off feature is customizable on this product. A nine-foot swivel cord with a hanging loop makes styling at angles less of hustle. The curling rod comes with a heat resistant glove to protect you while styling and the added cool tip makes styling a breeze. The smart sense microchip regulates the heat distribution on the curling wand making sure that it’s even. This will give you a more balanced look and make your waves or curls last longer. This curling wand may be a bit pricey but with such exquisite features seems worth it. Those of you with long hair will love this curler from CHI. An extra-long curling barrel that gives you the power of limitless hairstyles thanks to its rotating barrel. It has back, forward and reset options for rotating. Its heat can be adjusted using the controls and set to exact temperature that is easily seen on the digital display. The one-inch ceramic barrel will work well especially if you have coarse hair. The barrel emits negative ions that reduce frizz and split ends. The long 9foot swivel cord allows you to style even the back of your hair effortlessly. At a weight of two pounds, this curler is lightweight, and its ergonomic design is engineered to give you a comfortable hold .the wand heats up to a maximum temperature of 450f those with thick, coarse hair know this is a blessing as it’s hard to keep curls in their hair. Loose curls will create a beachy wave look if you’re going for that. You might want to consider other curlers for shorter hair since the clip won’t hold short hair onto the barrel. The curler heats up in just 30 seconds saving up on time .make sure to use a heat protectant when using higher temperatures to avoid burning your hair. It might take some adjusting to using the Marcel curler because it doesn’t have the traditional spring clamp but once you do, it becomes easy to create those loose beachy waves. With a one 1/4inch barrel, this curler is suitable for most hair types. You don’t have to worry if your hair is short or long this curler will give you those beach waves that you long for. With a longer handle than barrel this means that you can maneuver your hair to create different styles easily without burning your scalp. 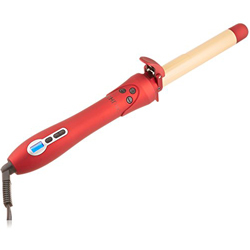 The far infrared technology on this curler is best for fighting that dreaded frizz to give you smooth and shiny curls. With sol-gel technology and a Nano titanium/ceramic barrel, you can be assured that your waves will last even to the next morning if covered up at night. The curling iron heat up to a maximum heat of 450f. The surround heat system improves your styling process while the turbo heat boosts your heat levels for that extra kick. After every curl has been created the curling iron has a fast heat recovery period that is almost instantaneous. Once you get used to the long handle, this iron is perfect for creating those loose curls and flicks that give you the beach waves that you desire. 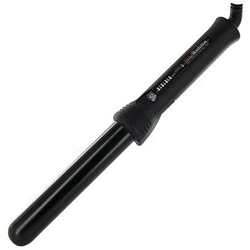 The beachwaver curling iron reviews all agree that this Sarahpotempa model is the way to go. Why? Because it does all the hard work for you! It literally rotates itself through each curl, so that your wrist never twists. It’s been featured on numerous television shows and magazines as a favorite of celebrities when they want to get both a red carpet and perfect summery look because it transitions so easily between both. So how does it work? Simple. You clamp each section into the iron while holding the iron horizontally. Press the L or R button (for left or right side of hair), and then press Go. And “go” it does! The iron will rotate on its own in the direction you chose until it reaches the base of your head. Let the clamp go, and the curl is released. Remove the beachwaver right through the middle of each curl. The ceramic rod is infused with both tourmaline and gold powder to maintain constant high heat, and you can be sure the custom clamp means no snags, kinks, or that “crimped” look on any sections of hair. so it is The extra long 6.5-inch rod has an ergonomically designed handle and heaters that run the entire length of the barrel. The digital temperature control with LED screen reaches heat levels of 310-450F in just 30 seconds. Due to its high heat, there are multiple safety mechanisms like a 30-minute auto shut-off and a cooling safety stopper and rubber stand. The 9-foot cord has a 360-degree swivel to keep hair moving in a fluid motion each time. A 1-year manufacturer’s warranty is available. The InStyler is often voted the best curling iron for waves because of its self-rotating feature. If you’ve never tried a rotating iron, you simply must. It’s the hottest new thing in creating soft and bouncy waves that always look sleek. After all, we want beachy waves, but not waves that look dried out by the sun, right? This InStyler doesn’t just rotate, it rotates in both directions. With an easy double-click, you can change the direction to move with the natural flow of your hair. It features two main parts. The first are black plates that are a combination of ceramic and tourmaline. One side is a traditional barrel while the opposite side is curved to fit, like two puzzle pieces. The second main part is the four rows of ionic bristles that smooth hair as you go. These two main parts, when put together, both brush and curl your hair simultaneously. To use, simply wrap each section of hair around the barrel near your roots. As you slowly pull through your hair, the iron will start to rotate. The first set of bristles will separate your hair as you go. As it continues rotating, the second set smoothes and brushes, leaving you with a shiny, frizz-free curl. The InStyler reaches a high heat level of 425F in just 30 seconds with four total settings in fine, medium, thick, and coarse hair. Though it reaches such a high heat level, it actually uses less heat due to the continuous rotation and brushing. Heat never sits on hair for a prolonged length of time. Safety features include auto shut-off, a heat shield, and a mat for protecting countertops. One look at the sleek and polished clipless curling iron and you know why it’s one of the best curling irons for beachy waves. Unlike the previous two models, it doesn’t rotate for you, but its lack of clip makes it easy to wrap each piece of hair quickly and flawlessly. The ceramic tourmaline combo of the cylinder gives off far infrared heat and creates mega amounts of negative ions to counteract frizz and boost shine from day to night. To style, start with sectioned hair. Select pieces that are not too chunky or thick. This helps you create those loose waves easily. That’s what beachy waves are, after all! Begin to wrap the first section around the barrel from root to tip. Be sure to twist hair as you wrap at the same time so that each piece has a little extra boost and twirl to it. In whichever direction you wrapped with the first piece, make sure to go the opposite way with the second piece and continue until every strand is curled and you’re ready to shake it all out. What Sedu calls the “Dynamic Alignment System”, the heat throughout the barrel maintains an even temperature to stay in contact with each piece of hair from root to tip as you style. The 25 mm model is the middle of their three sizes offered and the digital temperature control adjusts to different levels up to 350F. For newbies or heat-sensitive gals, a heat-resistant glove is included and the grip is heat-resistant. For extra safety, it features auto shut off and a kickstand to keep the cylinder pointed upward when styling is finished. A 2-year warranty is available. Those of you who have watched television shows such as bay watch know how those girls have effortless Beachy waves. A curling iron creates the waves. The key to getting them as looking as natural as possible is in both the technique used and the curling iron used. When shopping for a curling iron that creates Beachy waves there are several factors to consider such as plate material, barrel size, and a clamp. We have done in-depth research on the various features and give their effects. The following is what you should look out for before buying a curling iron that can achieve Beachy waves. When creating Beachy waves even the shape of the barrel can affect how they turn out. If you use a same width curling iron, the waves will turn out even and still look good. If you want them to seem a bit more natural, use a conical shaped barrel. The thin tip makes it taper at the tip giving it more definition.Several new additions to the curling iron family have made achieving Beachy waves a lot easier. New forms of curling wands come with grooves that make curling easier. Hair is wrapped around the grooves and gives you automatic Beachy waves.Professionals prefer a Marcel curling iron. Unlike the traditional curling irons it has a longer handle than barrel.It may take some getting used to but gives the best curls.Reverse barrels give a more defined look, especially for shorter hair types. The choice between a curling iron with a clamp or one without ultimately lies with the user. If you are new at curling hair, a clamp will make it less hectic for you.It holds the hair n place while the barrel forms the curl.A clamp will also come in handy if you have short or fine hair. Both types of hair are difficult to keep on the barrel while curling.If you choose to go with a curling iron without a clap, ensure that you invest in a heat resistant glove. The tricky part about curling irons without a clamp is that you will have to hold the tip of your hair to keep it on the barrel. You could easily burn your fingertips while doing this. As mentioned above the process of holding your hair while using a clipless curling iron can be a hassle. Buying one with a long cool tip ensures you have something insulated to hold on to.This will prevent burning off your fingers.A short cool tip could heat up at high temperatures and still end up burning you. With the above information choosing, a curling iron should now be easier. Now we all know curling irons are not a one size fits all. different hair types have different needs. Fine hair requires less heat; colored hair needs moisture and curl hair needs frizz to be tamed. When it comes to your hair type, there are a few things you should consider before buying a curling iron. We all know the worst thing you could do is to burn your hair. There is no coming back from that experience. If you have natural hair, it’s even more sensitive and needs extra care. Buying a curling wand without a heat control dial is not recommended.If you have fine hair, go for one that has a low temperature setting to avoid burning your locks.On the other hand, thick haired ladies will want to go for curling irons that can actually curl their hair. We all know how stubborn coarse and thick hair can be especially when it comes heat styling. Look out for curling irons that achieve at least 350F. The material that the barrel is made from will affect the outcome of your styling process. If you have thick hair, titanium or gold barrel will prove more heat transfer. The more the heat, the easier it will be to curl thick hair.Ceramic or tourmaline curling irons will prove to be better for fine hair. 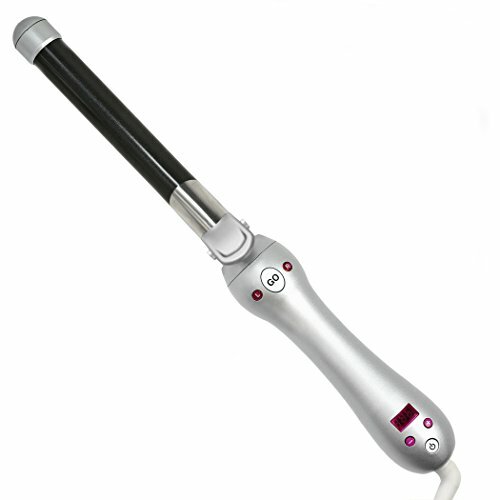 The ceramic barrel provides even heating and is less likely to burn fine hair.Color treated or damaged hair will retain moisture if a ceramic curling iron is used.If you have curly hair, then you know how hard it is to bend it or style it.Use a titanium curling iron that produces more negative ions and fights off the humidity that would otherwise cause frizz. Depending on whether you have long or short hair. The length of your barrel should be longer for long hair types. If you buy a curling iron with a short barrel, you won’t have enough room to wrap your hair around.Shorter hair types obviously need shorter barrels. Using a long barrel could lead to burnt foreheads or napes. Deciding on which curling iron to buy should be a whole lot easier now that you have read the above article. We always insist on doing what is best for your hair type. A marcel curling iron achieves the best curls but requires a learning curve. A normal barrel will give simple even curls. If you want a more tapered curl, go for the conically shaped curling irons. The heat from a curling iron can be high. Since the hair is wrapped around the barrel, it curls fast and should only be on for 2-5 seconds. 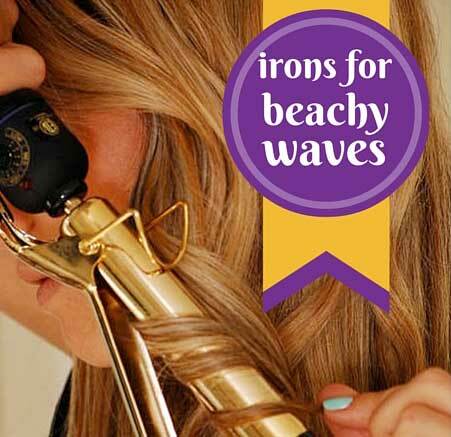 We hope the information has helped you decide on the right curling iron to achieve Beachy waves. With the top section of hair clipped up and away from your face, curl the first section of hair in any direction you like. Curl the next piece of hair in the opposite direction. Curl the next piece of hair in the opposite direction again. The key is that you are always going back and forth one piece at a time. Continue this way, letting down sections of hair from the top, until you are finished. Always always always finger comb your beachy waves, and never brush them out. Gently pulling hair through your fingertips, spray with your favorite hairspray or anti-frizz spray. Four Easy Ways to Get Beachy Waves! Summer is here, and school is out, and you want to create that loose curl, beachy waves look or you just want to switch styles .looking to know how to do it? We have compiled four easy ways to achieve this relaxed look. Here a few tips and tricks to getting the perfect look using a curling wand. Use a larger sized barrel such as a 1.5 inch for larger curls or 1-inch barrels for tighter curls. If you have a small-sized rod, just wrap more significant amounts of hair around the wand for larger curls. Try curling your hair in different directions for a more natural relaxed look. This also prevents portions of curled hair from clumping together. After curling your hair try sleeping on them for the small curls to loosen and finger comb the roots for a messier look. This item not only straightens your hair but can double up as a curler. Apply a heat protectant to your hair before using the iron .proceed by spraying a small amount of flexible hold spray to your hair .this will let your curls last for longer. Wrap your hair around the flat iron and face the tip downwards instead of the usual horizontal way you do while straightening, don’t hold it for too long, though, lest you burn your hair. Using the flat iron this way will give you a more relaxed and natural look. Remember to finger comb your roots. It seems almost impossible with short hair to get the beachy waves look, but you can use a curling iron to create the look quickly. There a few tips you can employ to make your hair look wavy without looking washed up. Curl your hair away from your face and around the curling iron while it faces the floor for well-defined curls. Hold it horizontally to add volume. Alternate both the direction in which you curl the hair and the way you hold the iron to create a more natural look. Use sea salt spray to add more texture to the finished look. We are back at it again with the flat iron. You can use a combination of twists and the flat iron to create smooth beach waves. This method probably takes the least time as it entails twisting a portion of hair then pulling a flat iron down on the twisted hair. Untwisting the hair will reveal loose beachy waves. Finger comb your hair, and you can even try to shake your head gently to give your waves a natural look. Use a flexible hold spray and heat protectant always when using a flat iron. All these simple methods will take you less than 15 minutes to achieve. The sea salt spray gives you a more textured look. Whichever ways you choose to style your beachy wave always remember to use a heat protectant to protect your luscious locks. $ Nano titanium barrel 1-¼ inch Turbo heat boost temperature. Whether you’re just about to come up on summer in your part of the world or you’re about to hit the road for a beach vacation, you absolutely must try your hand at creating a gorgeous beachy wave hairdo for your locks. Whether you want something more traditional like the Sedu wand or to try your hand at one of the awesome new self-rotating tools from Sarahpotempa or InStyler, check out our Amazon page from the button near the product to get the Best Curling Iron for Beachy Waves now! Great tutorial. And nice list if tools to choose from. 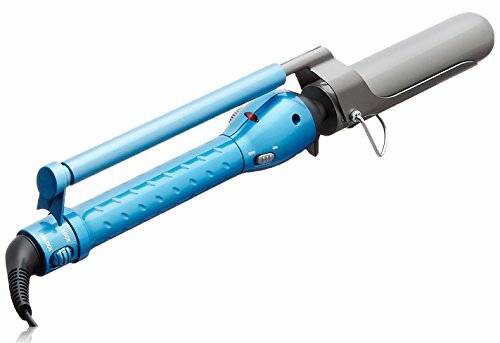 I’ve been looking for my own curling iron and I’m considering Sedu Revolution Clipless Curling Iron. Thank you for your help.